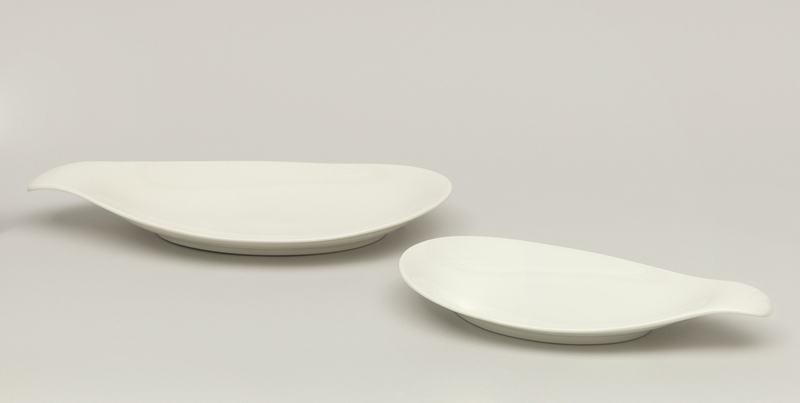 See more objects with the tag kitchen, dining, minimalism, teardrop, stacking, recycling, white porcelain. See more objects with the color dimgrey rosybrown or see all the colors for this object. This is a Dish. 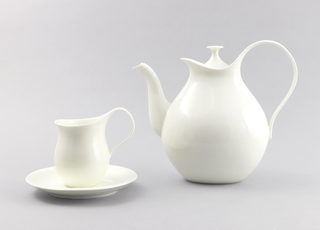 It was designed by Eva Zeisel. It is dated ca. 1952 and we acquired it in 1990. Its medium is glazed porcelain. It is a part of the Product Design and Decorative Arts department. It is credited Gift of Mel Byars, The Mel Byars Collection of 20th Century Design. On base, in blue: "HALLCRAFT / CLASSIC / SHAPE BY / [Hallcraft logo in gray of 'HC' conjoined] Eva Zeisel / MADE IN U.S.A. BY HALL CHINA CO."